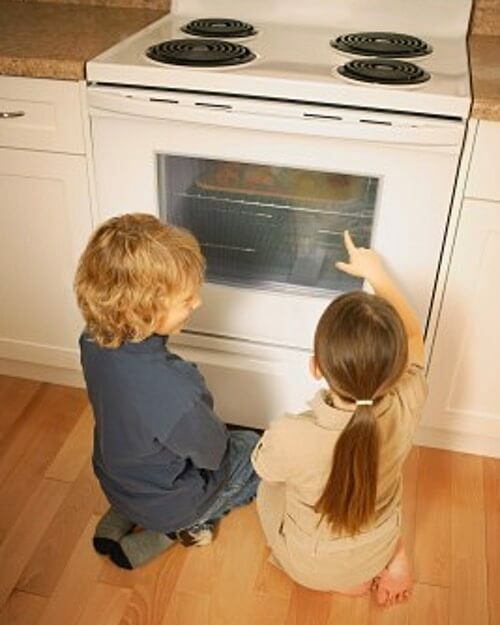 You'll find oven temperature conversions along with baking times and answers to other questions you might have below. What's a slow oven? How does the temperature of a moderate oven compare to a fast oven? And how on earth do you test for doneness? 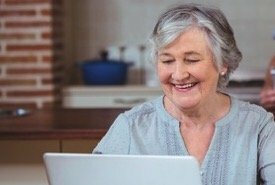 These are some of the questions most often asked when readers begin baking with old fashioned recipes. But, don't worry, it's all covered below. 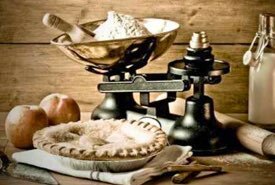 You'll find oven temperature conversions are often needed when baking, because the old fashioned baking recipes originated in the 1800s and early 1900s when wood stoves were common in household kitchens. Maintaining an even oven temperature when cooking with wood required know-how, constant vigilance, and a ready supply of firewood. Likely you'll have noticed that most vintage recipes do not specify exact oven temperatures and baking times, but simply suggested using a slow, moderate, or fast oven. That's because very few of the old wood stove ovens had temperature gauges. On Mom's old kitchen cook stove, there was simply an ornamental metal trim piece on the oven door that you touched to judge whether the oven was hot enough and ready for baking. Experience and the occasional burnt fingertip taught you when the oven was hot enough. But, the temperature of the oven varied with the strength of the fire, so Mom always had to test for doneness while baking. Instructions on how to convert oven temperatures, and the approximate wood stove oven temperatures for baking are provided below to assist you in obtaining good baking results with a modern-day oven. Grandma's old fashioned dessert recipes should turn out okay when using these basic oven temperature conversion tips. Pastry Oven: A piece of writing paper will curl up brown when it's at the proper heat for baking pastry. Note: Oven baking temperatures can vary 25°F (4°C), plus or minus. To convert degrees Fahrenheit to degrees Celsius in recipes, subtract 32 from the Fahrenheit temperature, multiply the difference by 5, and then divide the product by 9. To convert degrees Celsius to degrees Fahrenheit, simply multiply the Celsius temperature by 1.8 and add 32. Carefully testing for doneness every few minutes is always recommended for best baking results. When a teacher of Domestic Science, the Professor's wife was accustomed to using a "pyrometer" or oven thermometer to determine the proper oven temperatures for baking. 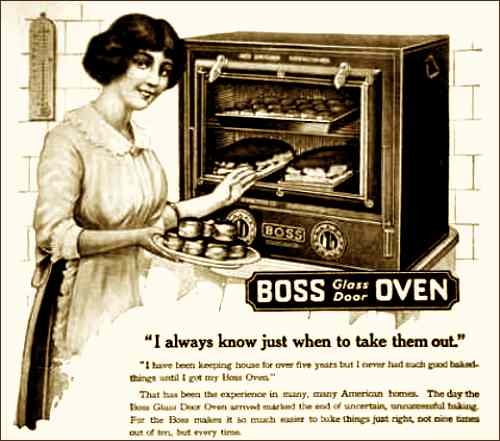 She explained its advantages over the old fashioned way of touch-testing the oven to Mary and gave her a copy of the "Cooking Schedule," to put in her recipe book, which Mary found of great assistance, and persuaded Aunt Sarah to have one placed in the oven door of her range. One of the reasons why I try to always place several old fashioned recipes on a page is that — hopefully — one of those recipes will contain clear instructions as to baking times and/or baking temperatures. For instance, if one of the cake recipes suggests 30 minutes in a "moderate" oven, those instructions should work for other recipes for the same type of cake. Basic oven temperature conversion places a "moderate" oven at 375°F. Ultimately, all you can do is use the recipe's suggested time and temperature, if given; but before your baked item is expected to be done, begin to check it visually for doneness. 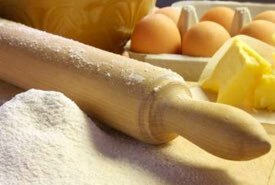 For instance, cookies should begin to brown, and you can insert a wire cake tester or fork into a cake to test it for doneness. If the wire cake tester or fork comes out clean without batter or crumbs attached, the cake is done. And don't worry, most of the vintage recipes are quite forgiving. By comparing similar recipes and by using the oven temperature conversions, you should do okay. I recall that whenever Mom tried a recipe that was new to her, the first attempt was pretty much an experiment. Most times it would turn out near perfect, but there were those occasions when something went wrong, and it was a flop. That's simply the way of baking, even with some modern-day recipes. Experimenting with the old fashioned dessert recipes and mastering them is a big part of their fun; that and getting to taste the desserts and treats that our ancestors once enjoyed. When you're a kid, though, the baking time seems endless. 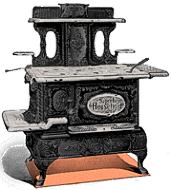 Luckily, most kids today can watch cakes and cookies baking through an oven window whereas with our old kitchen wood stove, all you could do was smell the wonderful aroma and dream of the taste to come.